Do you have a wifi ready Sony TV? If so this could be the adapter for you as it brings wireless access to your living room! 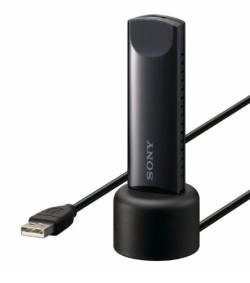 The Sony UWA-BR100 wireless adapter also allows you to get your wifi enabled Sony Blu-ray player or Blu-ray home cinema system online and ready to stream video on demand content and catch up television services without the need for miles of tangled wires. Imagine being able to show your facebook or twitter pages to you friends and family. What easier way than to use that huge TV we all have sitting in our lounges these days? Combining your broadband internet connection and your internet ready TV you can access youtube and other video clip sites to get the video you want, when you want it. Wireless access to your home media libraries are caterd for with the DLNA technology that the Sony UWABR100 wireless adapter sports. Stream from you laptop, pc, mobile or mp3 player. The Sony UWABR100AEP works with all of the common wifi standards (802.11a/b/g/n) allowing the best throughput to stream high definition content to your TV.